Toys are not just for kids, but for the big boys (and girls) too! Comics, cosplay, anime, collectibles, gaming -- these are just some of the things we can expect at a comic or toy convention. And believe me when I say that my collector-husband and anime-addicted kids are most excited to attend the upcoming ToyCon 2016 + Pop Life FanXperience happening on June 10 - 12 at SMX-MOA! A few years ago, I actually featured some of hubby's toy collections here (samples below). He dreams of attending a comic con in the US if given a chance, while the kids naman wish to visit the Pokemon Center in Tokyo. Some cousins are also into toy collecting and cosplay. I'm sure they're highly anticipating this event as well. Ako lang at a ang walang hilig sa mga ganyan, hehehe! But they have my support on this, that's why I'm taking them to ToyCon Philippines this weekend, thanks to Smart! Yay!!! "TOYCON Philippines is proud to announce it's partnership with Pop! Life Entertainment to create the ultimate FanXperience for the Filipino pop-culture fans. Special appearances by celebrities, comic artists: Hollywood actors including Kristian Nairn (Game of Thrones), Dean Cain (Lois & Clark: The New Adventures of Superman); Daniel Logan (Star Wars), and many others! 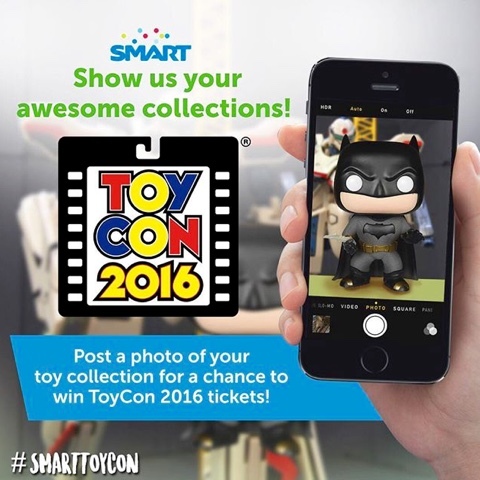 WIN ToyCon 2016 tickets from SMART! It's that simple. Smart will get in touch with you if you win. Good luck! For Smart subscribers, be sure to load up with Smart Big Bytes 50 for more data to share all your fun experiences during the convention! Only Php 50 valid for three days. Just text BIG 50 to 9999.